Machine That Makes Drinking Water From Thin Air #NatureAndTechnology « Adafruit Industries – Makers, hackers, artists, designers and engineers! The World Health Organization reports that 780 million people don’t have access to clean water, and 3.4 million die each year due to water-borne diseases. But an Israeli company thinks it can play a part in alleviating the crisis by producing drinking water from thin air. 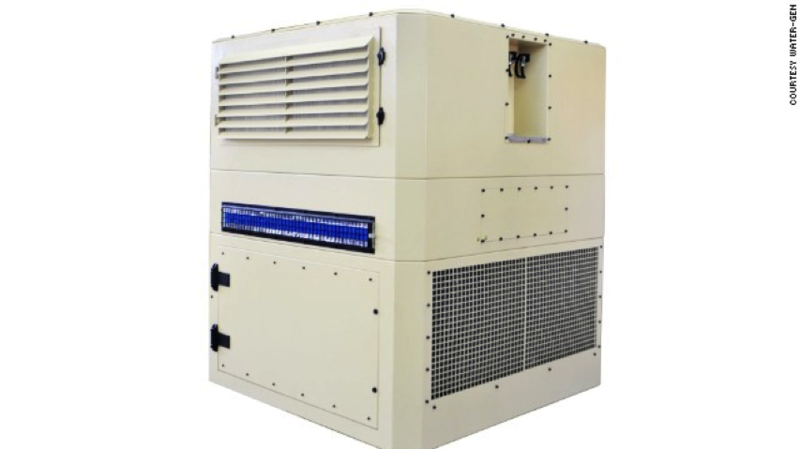 Water-Gen has developed an Atmospheric Water-Generation Units using its “GENius” heat exchanger to chill air and condense water vapor. “The clean air enters our GENius heat exchanger system where it is dehumidified, the water is removed from the air and collected in a collection tank inside the unit,” says co-CEO Arye Kohavi. Capturing atmospheric humidity isn’t a ground-breaking invention in itself — other companies already sell atmospheric water generators for commercial and domestic use — but Water-Gen says it has made its water generator more energy efficient than others by using the cooled air created by the unit to chill incoming air. The system produces 250-800 liters (65-210 gallons) of potable water a day depending on temperature and humidity conditions and Kohavi says it uses two cents’ worth of electricity to produce a liter of water. Developed primarily for the Israel Defense Forces (IDF), Water-Gen says it has already sold units to militaries in seven countries, but Kohavi is keen to stress that the general population can also benefit from the technology. Kohavi says Water-Gen’s units can produce a liter of water for 1.5 Rupees, as opposed to 15 Rupees for a liter of bottled water.